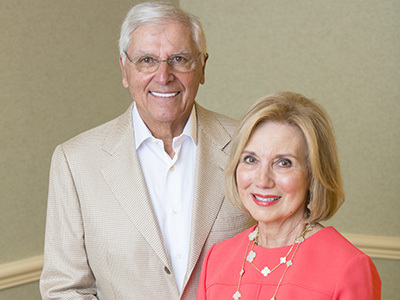 University Trustee Dan Mezzalingua ’60 and his wife, Kathy G’62, are generously supporting future generations of high-achieving students at Syracuse University through a $5.25 million gift for undergraduate financial aid. Their support is directed to the Invest Syracuse Initiative, a $40 million fundraising effort for new student scholarships. The Invest Syracuse Initiative is part of Invest Syracuse: Advancing Academic Excellence and Student Experience, a $100 million initiative that seeks to redefine the student experience, advance discovery and innovation, and expand opportunity, access and affordability. The couple is excited by the work being done by Chancellor Kent Syverud and his leadership team to provide new possibilities for students through Invest Syracuse and advance the University’s academic excellence. “The Chancellor is strengthening Syracuse University academically. He’s been really doing a wonderful job enhancing the entire institution,” Dan Mezzalingua says. Giving back in support of students and the University is important to Dan Mezzalingua, who is thankful for the opportunities that were provided to him by the faculty and staff during his time at Syracuse. He recalls the support and assistance of then Dean of the College of Liberal Arts Eric Faigle who put him back on track after Dan had left SU without completing some exams to briefly attend another school. Working his way through college, Dan, who was a member of Sigma Phi Epsilon, would pay his own tuition throughout the semester, sometimes asking for payment extensions from the Bursar’s office. “I will never forget how good they were to me, and I want to do whatever I can to give opportunities to other students,” he says. Kathy, who is from the Syracuse area, earned an undergraduate degree in retail from Marywood University in Scranton, Pennsylvania. She received her master’s degree in education at Syracuse while working as a teacher in the Syracuse City School district. “There weren’t a lot of opportunities for retail in Syracuse, so I decided to teach and I found I really did love working with adolescents,” Kathy says. Kathy taught for several years in the school district before the couple married, and she then retired to have and raise their six children. Dan worked with his father, who had a small machine shop, and started to build the family business by manufacturing patented products. They purchased an operation that created parts for community antenna television systems, the beginning of the burgeoning cable television industry in the 1950s and 1960s. “We started making machine parts and that developed into coaxial cable connectors, and eventually into other parts for cable systems, such as amplifiers and cable,” Dan says. The family later developed manufacturing plants in Copenhagen, Denmark; St. Kitts, West Indies; and Suzhou, China. As their family and company, Production Products Co., flourished, the couple began to think about how to share their blessings with others. “We were very blessed in terms of what had occurred for us, and we wanted to make sure other people had opportunities through meaningful help,” Dan says. Over the years, Dan has served with many civic organizations, including the United Way Resource Development Committee, Community General Hospital Foundation and the Manlius Pebble Hill School Board of Trustees. For Syracuse University, he served on the Executive Committee of the Board of Trustees, and was a member of the Society of Fellows and the Chancellor’s council. He served on the Whitman School of Management Advisory Council and the lead trustee on the Schine Student Center Campaign. Growing up, Kathy was inspired by her father who was an attorney and provided free services to those who were not able to pay. “I saw how he gave back. Dan and I were blessed with six children and as the business started to grow I knew that we had an obligation to give back to the community,” Kathy says. She eventually became involved in such organizations as Hospice of Central New York, Friends of the Central Libraries and the Order of Malta, a Catholic lay organization that assists the elderly and poor in the community. The couple and their family also became deeply committed to redeveloping a private Catholic school in St. Kitts, where their daughter Laurie oversaw the family’s business operation on the island. Laurie had been approached by the school’s nuns about providing some basic supplies, but she realized that their needs were much greater. The family funded the construction of a library, which the school named after Laurie, and eventually created five buildings. The school has grown to an enrollment of 500. Laurie passed away from breast cancer eight years ago, but her legacy continues not only through the school but also in the Saint Agatha Foundation, which she started to help pay the medical bills of patients unable to afford their treatment. Kathy, at the request of her daughter, now operates the foundation, assisting breast cancer patients in Central New York with all treatment and recovery related costs not covered by other insurance. “When she was going through breast cancer, her mantra became ‘helping those who cannot afford their illness,'” Kathy says. Laurie’s spirit of giving continues through her family’s support and volunteer work in the life of their community. It’s an important message the Mezzalinguas want to pass on to others.